The Second Annual Toronto Dingos Pub Golf Invitational was claimed by first year player George Craig and coach Justin Robertson. With much hype surrounding the corrupt commissioner, Shaun McKay and his ad-lib rules, the event was a huge success and attended by 20 players who formed 10 pairs all hungry for the green jacket. It came down to the final hole and scores were tied between the Craig-Robertson pair and the Evans-Everett duo. To decide the winner, the commissioner ordered a one-man pint-off which Craig won in quick time. Last year’s winners Wade Edwards and Big Butch failed to fire and did not even rank in the top three in what was described as "one hell of a shank” by The Shark who was on a yacht in Toronto streaming the event live. A big thanks must go to Shaun McKay, the commissioner, for putting the day on and running a tight ship. 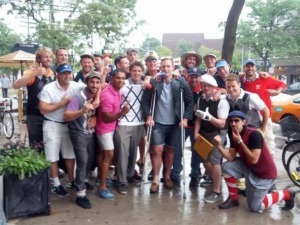 All players are looking forward to the 3rd Annual Pub Golf Invitational already. Here are some photos of the tournament.